Even a veteran traveler like myself can still get nostalgic with a rare visit to the town where I spent my formative years and half of my life. 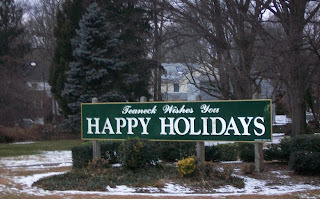 Teaneck, New Jersey - population approx. 45,000. 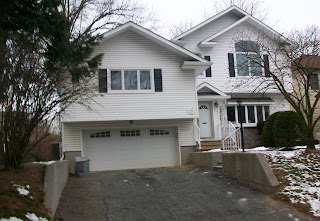 About 5 miles west of the GW Bridge and 5 miles east of the shopping mall empire of Paramus. Thomas Wolfe wrote "You Can't Go Home Again," and if you could, would you recognize it? I hadn't been back in over 7 years, and it's amazing how much smaller my suburban bedroom community seems. If this house wasn't located on Ogden Avenue between Sussex and Rugby, I probably wouldn't have picked it out of a lineup. Even though it was my home address from 1973-1993. And what about the track that I ran around thousands of times in my life? It's been moved in conjunction with the football field. But the tacky, outdated Highwaymen scoreboard which was still there when I graduated in '87 was still presiding over the field. The real reason for the visit? Bringing the kids for the first time to the town where Daddy grew up. 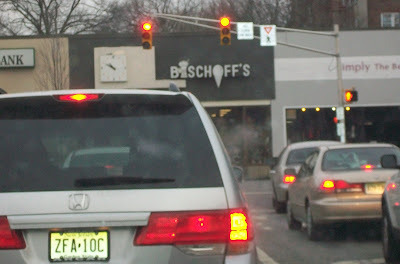 And a visit to Cedar Lane and Bischoff's of course. Where the same manager was working behind the counter. I rocked the tuna melt and chocolate ice cream soda with chocolate marshmallow ice cream. The kids ordered grilled cheese sandwiches and declined ice cream since it was a wind-chill of about 10 degrees outside. What do they know growing up in the paradise of Savannah, Georgia? Wimps.